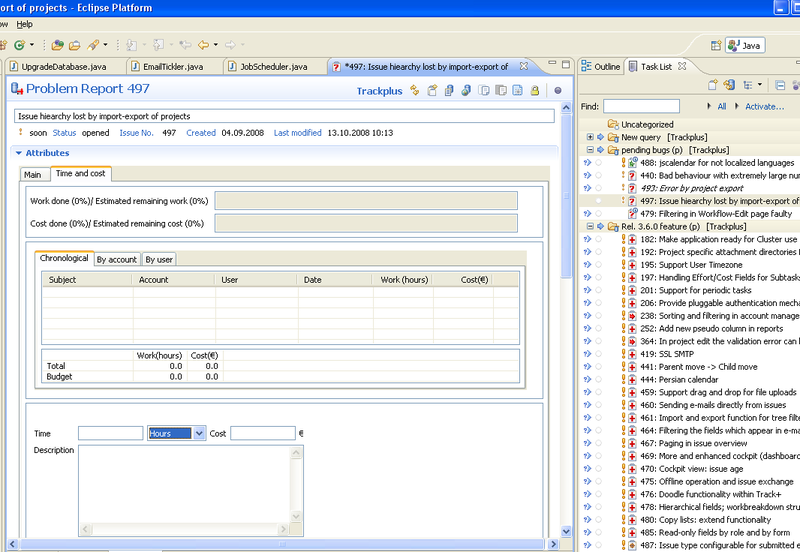 Trackmylyn is a connector for the Eclipse Mylyn task based user interface (see http://www.eclipse.org/mylyn). From the Eclipse Mylyn home page: "Mylyn is a task-focused UI for Eclipse that reduces information overload and makes multi-tasking easy. It does this by making tasks a first class part of Eclipse, and integrating rich and offline editing for repositories such as Track+. Once your tasks are integrated, Mylyn monitors your work activity to identify information relevant to the task-at-hand, and uses this task context to focus the Eclipse UI on the interesting information, hide the uninteresting, and automatically find what's related. This puts the information you need to get work done at your fingertips and improves productivity by reducing searching, scrolling, and navigation. By making task context explicit Mylyn also facilitates multitasking, planning, reusing past efforts, and sharing expertise." Before you start, please take a look at the prequisites. In tab "Installed Software" check that you have Mylyn installed. If Mylyn is not installed, or it is not the proper version (3.0.2 or later) switch to the "Software" tab and install or update. If Mylyn is not listed, click on button "Manage Sites..." and enable the Mylyn update site from the list you get there. Then come back here. Enable all Mylyn features and click on "Install...". Click on "Add Site..." and enter the Trackmylyn update site as shown below (http://www.trackplus.com/update-site/e4.3/tp41). Click on OK. Enable the Trackmylyn feature and click on "Install...". The Trackmyln adapter will be installed. It is recommended to close Eclipse thereafter and restart it. You are now ready to use Trackmylyn together with a Track+ server. You may want to have a look at the instructions on how to configure Trackmylyn to work with your server. Before you start, make sure have have Trackmylyn installed. If not, have a look at the installation instructions. Furthermore, make sure that you know the URL of your Track+ server. Ask your administrator if on that server the web service is enabled. Select folder "Mylyn", and there select "Task Repositories". A new view (tab) named "Task Repositories" appears, typically in the middle bottom view area of Eclipse. Open the context menu with a right mouse click in this area. Click on "Add Task Repositories". In the mask that appears enter your Track+ webservice server URL. It is typically your regular Track+ server URL which you access with your browser, plus the path "service/TrackplusService". For example: "http://www.yourdomain.com/track/service/TrackplusService". Enter your Track+ server login name and password. Click on "Validate Settings". If everything went okay, you are now ready to use Mylyn with Track+.